The Government is seeking to ensure that all businesses and communities are represented by one Local Enterprise Partnership (LEP) - a problem for the Sheffield city region (SCR) where only three of the nine member authorities are currently only a member of one LEP. The SCR was given the green light to establish one of the UK's first LEP in 2010. Led by the private sector, LEPs are the Government's model to promote economic development. They provide the strategic leadership required to set out local economic priorities, and better reflect the natural economic geography of the areas they serve. Last month, the Government published its "Strengthened Local Enterprise Partnerships" report, making it clear that the mission for LEPs is to address productivity. Specifying a number of changes that LEPs are expected to make, it looks at roles and responsibilities; leadership and organisation capacity; accountability and performance; and geography. In a paper to its board, the SCR LEP admits that: "The issue of greatest immediate concern, due to the need to respond to Government by the 28th September, is the removal of overlapping LEP geographies. This poses a number of challenges in the SCR where the only three of the nine authorities comprising the City Region are currently only a member of one LEP. "Over the summer partners will need to consider and agree their response on this issue to form a consensus. This will need to be submitted to Government by their deadline." On geography, the Government report states that, as LEPs now oversee significant amounts of public funding and have an authoritative voice in shaping national and local policy, "it is important that accountability for decisions and responsibility for investment is clear." The report adds: "On balance, Government considers that retaining overlaps dilutes accountability and responsibility for setting strategies for places and so will seek to ensure that all businesses and communities are represented by one Local Enterprise Partnership. Close collaboration between Local Enterprise Partnerships will replace overlapping responsibilities. "In looking to remove overlaps, we will also need to ensure that Local Enterprise Partnerships are operating over a significant enough scale to provide the strategic direction and efficient delivery of future programmes." 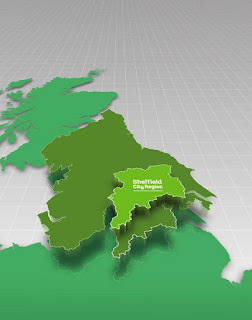 Just Sheffield, Rotherham and Doncaster are solely in the SCR LEP area. Barnsley is also part of the Leeds City Region LEP and West Yorkshire Combined Authority. Non-constituent members of the SCR LEP - Bolsover, Chesterfield, North East Derbyshire, Derbyshire Dales and Bassetlaw - are also part of D2N2, the LEP for Derby, Derbyshire, Nottingham and Nottinghamshire. The waters were muddied further when Derbyshire County Council brought legal action before a proposed mayoral election and Chesterfield and Bassetlaw Councils withdrew their applications to be full members of the SCR Combined Authority. The Mayoral Combined Authority (MCA) comprises the nine SCR local authority leaders and the metro mayor and its current remit is strategic economic development and transport, with the constituent leaders being accountable for where public money is being spent. Dan Jarvis was elected as the mayor of the Barnsley, Doncaster, Rotherham and Sheffield Combined Authority in May. The Government is also requiring the SCR to develop an implementation plan by the end of October. Around £500,000 per LEP has been promised to implement the review and provide the strategic and analytical capability to develop an ambitious Local Industrial Strategy. On the Local Industrial Strategy, the SCR has not yet been given any fanfare by central government. Last week, the Business Secretary announced that the North East, Tees Valley, West of England, Leicester & Leicestershire, Cheshire & Warrington and the Heart of the South West will be the second wave of areas to benefit from working with the Government to develop their local Industrial Strategies. Unfortunately, partly due to the delays (after a fast initial launch) in the SCR LEP actually having an impact (so its benefits not obvious), we now have a mess - that probably needs the wisdom of Solomon to sort out (but unfortunately he died a long time ago). In the meantime, business opportunities are being lost (to less deserving areas).